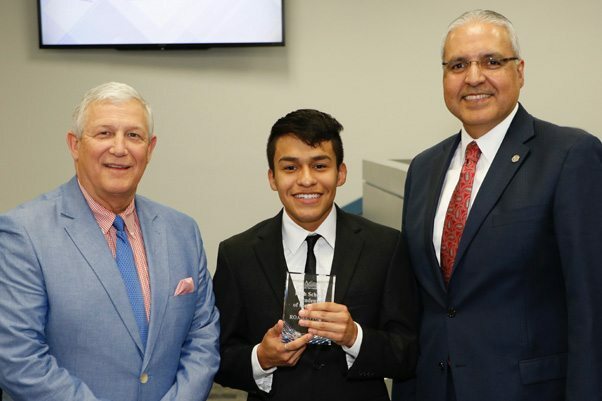 Congratulations to March 2018 High School Student of the Month Luis R. from Sam Houston High School! Luis is an outstanding senior at Sam Houston where he is on track to finish in the top 2 percent of his class with an IB diploma and many pre-AP and AP credits. Luis is very active at Sam Houston. In Business Professionals of America, he has qualified for a national competition on the web design team. Luis has also been active in Key Club, J.K. Livin’, Earth and Science Club, Texan GSA Club, and National Honor Society. As a student leader, Luis has been in student council for four years, serving this year as senior class secretary. He was named homecoming king in the fall, and he is currently the president of Sam Houston’s AVID Club. Luis has been a cheerleader for the last two years, and he is a founding member of the Texan Dreamer organization. Luis is an exceptional student who is a role model for others. He is representative of many other outstanding students at Sam Houston. Congratulations, Luis!